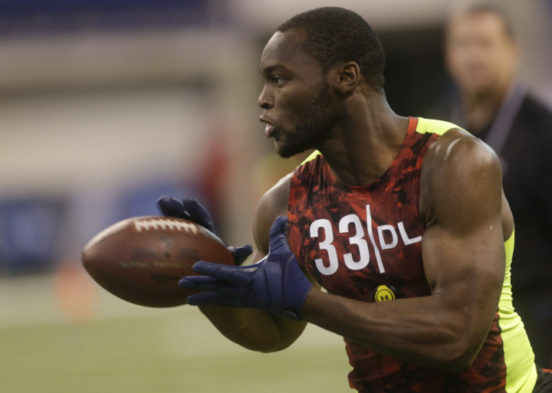 Seahawks signed DE Barkevious Mingo on the first day of free agency, lost CB DeShawn Shead to the Lions and let go RBs Thomas Rawls and Mike Davis. On the first day of the NFL’s new year Wednesday, the Seahawks signed DE/LB Barkevious Mingo and predictably sent away RBs Thomas Rawls and Mike Davis, then lost CB DeShawn Shead in free agency. Countering those departures, Seattle retained DE Dion Jordan, the No. 3 pick in the 2013 draft who returned to health last season, and also made official the trade of DE Michael Bennett to the Philadelphia Eagles. In addition, the Seahawks did not tender LB Dewey McDonald, now an unrestricted free agents. Rawls, Davis and McDonald could return to Seattle, but at a lower cost. Mingo, 27, was mainly a role player on the Indianapolis Colts defense last year. In 16 games and six starts, he had 44 tackles (32 solo), two sacks and three forced fumbles. Mingo saw most of his starting time when starting outside LB John Simon was injured. Mingo has yet to live up to the billing of being the No. 6 pick in the 2013 draft with the Cleveland Browns. Jordan will receive a salary of $1.907 million. If any team signs Jordan to an offer sheet, Seattle can match or get a first-round pick — the round in which Jordan was selected in 2013 — as compensation. Rawls looked like a budding star and a potential replacement for Marshawn Lynch in 2015 when he ran for 830 yards and 5.6 per carry. But he hasn’t been the same since breaking an ankle against the Baltimore Ravens late in the 2015 season. He interviewed with the Carolina Panthers Wednesday. Davis emerged as a starter late last season and was the leading rusher among running backs with 240 yards, trailing the 586 of QB Russell Wilson. Shead at one time appeared to be a starting corner, but tore an ACL in a playoff game at Atlanta, which sidelined him most of last season. The former special-teams captain inked a one-year, $3.5 million deal with the Detroit Lions that was more than $2 million over what the Seahawks paid him last season. Seattle also gave qualifying offers to five exclusive rights free agents — C Joey Hunt, RB J.D. McKissic, snapper Tyler Ott and DEs Branden Jackson and Quinton Jefferson. Exclusive rights FAs not tendered included LBs Paul Dawson, Christian French and Josh Forrest, DT Garrison Smith, DB Jordan Simone and OL Tyrus Thompson. Each becomes unrestricted free agent. Seahawks would love to have his disruptive power, but someone else is going to overpay him. He’s not quite the same force he was in DET. I am honestly not sure why either wants to talk to the other, seems a waste of time and travel money. We cannot afford S.Richardson so why leverage him with Suh? Suh will have plenty of interest so why go to a team that cannot afford him and shouldn’t pay him even if they could? Sometimes I think the agents and GM’s out think themselves. I’m not in love with this signing. His combine stats show that he could be a fit for a Chris Clemons LEO type role or even a DE/OLB mix like Bruce Irvin (without short distance speed) but even Belichick couldn’t get this guy on the field much as a pass rusher or even just a plain LB. Contract is quite good for us if he is a starter, but become poor as a role player and terrible as a special teamer like he ended up being on the Patriots. I guess the potential upside is worth it since we really need the next Cliff Avril signing and he is still young enough to play for 3-5 years. Giants guard D.J. Fluker is visiting the Hawks.